I really don’t know if it’s usual among the creative kind, or a result of the amazing responses to my last post, my mother’s creative mind seems to be in a super-active mode. The moment she saw her design on my blog, her enthusiasm grew ten-folds and before I could even realize, she had another extremely beautiful sari complete. I stood there gaping in amazement, partly because the entire sari was made in less than 5 hours, and secondly, I could not figure out from where she got such brilliant ideas. This is the “pallu” or the “aanchal” of the sari. The work originates from Assam. 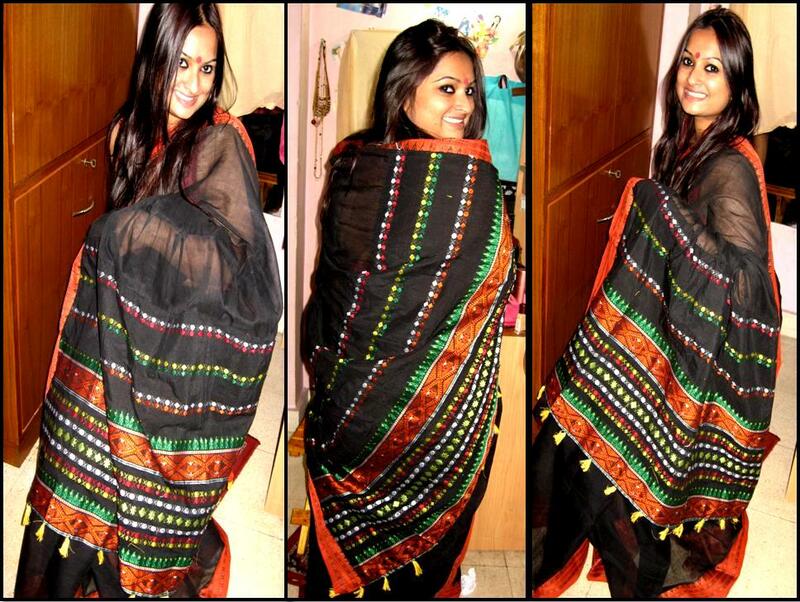 The sari is actually a Bengali “taant” whose pallu is fused with Assamese embroidery. The yellow droppings are made of cotton thread. 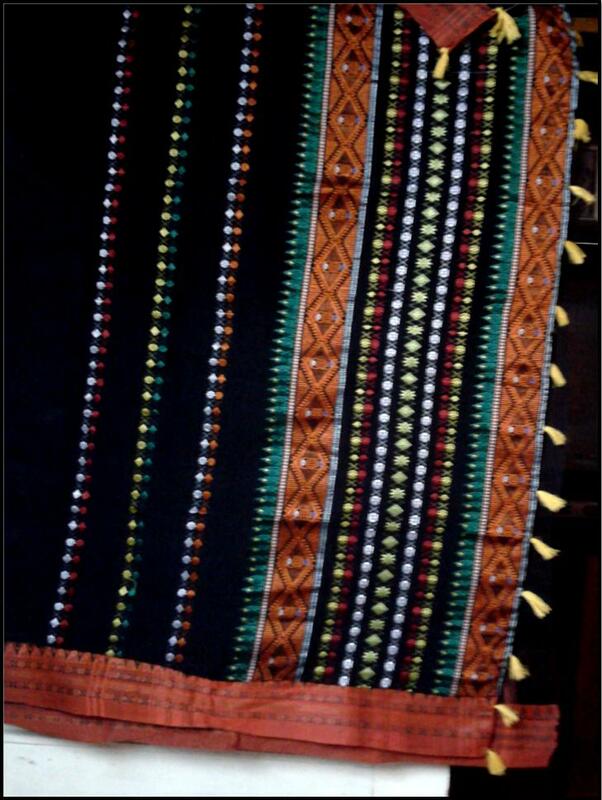 It’s made by bunching cotton thread together and stitching it to the edge of the pallu. So, basically, this Sari is a melange of the Assamese “Mekhla Sador” and the Bengali “Taant”. As soon as I saw the sari, I could not wait to drape it and pose. Mum has also made a coordinated black blouse with similar Assam work. But, I preferred to team it with a maroon halter necked blouse. Being an Indian, I have always believed that Sari makes a woman look the most elegant and beautiful, hence, my obsession with the 9 yards. Such a beautiful post, and so nice to know your mother is so enthusiastic, it’s lovely! She seems to be extremelly gifted and you look gorgeous! !